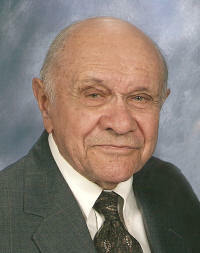 Joseph F. Kressig, 92, of Breese, died June 13, 2009 at his residence. Mr. Kressig was born October 3, 1916 in Salisbury, MO to Frank and Anna (Oser) Kressig; they preceded him in death. Also preceded in death by a brother, Leo Kressig, and sisters, Edna Smith, Lucille Beeler, Wilhelmina “Minnie” Armentrout, Helen Bertsch, and Cordell Humphrey. He married Florence Eschmann on May 28, 1949 at St. Augustine Church in Breese; she survives in Breese. Also surviving are his children, David (Carol) Kressig of Breese, Stephen (friend Eileen Wright) Kressig of Kauai, HI, and Mary Ann (Les Brandt) Kressig of Huntsville, AR. 2 Grandchildren, Sarah (Keith) Harvie of St. Louis and Jake Kressig of Breese & 3 Great Grandchildren, Miles, Kaden, and Savannah Harvie. Joe retired as a foreman where he did Tree Trimming for Local Union IBEW and also worked for Davey Tree Expert Company, Kent, OH. Member of St. Augustine Catholic Church and Men’s Sodality, Breese Knights of Columbus Council 2869, Breese Senior Citizens, and Union Local IBEW-Collinsville. Funeral Mass of Christian Burial will be Wednesday, June 17, 2009 at 11:00 AM at St. Augustine Catholic Church with Fr. Joseph Rascher and Deacon Bob Lippert officiating. Interment will follow in St. Dominic/St. Augustine Cemetery, Breese. Visitation will be Tuesday, June 16, 2009 from 4:00-8:00 PM and again on Wednesday, June 17, 2009 from 9:00-10:45 AM at the Moss Funeral Home in Breese. The Breese Knights of Columbus will visit the funeral home at 7:00 PM Tuesday evening. Memorials can be made to St. Augustine Church or Hospice of Southern Illinois and will be received at the funeral home.